BlogPress is a fully responsive blogger template very suitable for bloggers, marketers and writers. 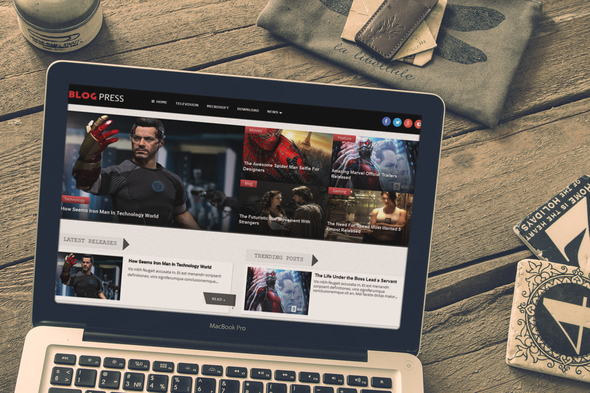 BlogPress is a sister template of wepress blogger template. It is a multipurpose, entertainment fully responsive and mobile friendly blogger template which comes with lot of dynamic features. BlogPress is a creative and has a flat stylish design very suitable for bloggers, marketers and writers. It has high quality responsive design and awesome looks that would make your website unique and more professional. Moreover, this theme is ideal for those who are curiously looking for blogging niche template. It also supports almost every browsers to load in a seconds. Ever first magazine style blogging template. 100% Responsive Mobile Layout: Like our latest sleek blogger template Blog Press template also designed for latest browsers to load it perfect. It has 100% fully responsive layout to load it from iphone, tablet, pc and mobile and desktop. Layout: Since BlogPress is a sister version of WePRess so it also exists in two different layouts interfaces. 1: One a Simple Layout Interface for Blogging. 2: Ads ready, Magazine with colorized interface. SEO Friendly Template: Search Engine like SEO friendly template well right, Our blogging team make it perfect seo friendly template like madeeha template. It uses h2 on home pages, h1 on posts pages and also configured hatom errors etc. You don't need to spend money on SEO. We made all the customization that needs for SEO. Navigation: A splendid responsive navigation installed on header wrap to navigate the site easily similar as our business bloggerTemplate, This would work perfect on mobile, tablet and iphone. Load Faster : We have integrated a light jequery widgets and plugins to load it faster on any browser. Visitors love a site open quickly a seconds. Ads Ready: Since This template is available in two different layouts and according to users requirements, one can select a perfect layouts for a websites/blog. It is almost ad ready template like the magazine one. Related Post Thumbnail: Related thumbnail widget would help to increase your site pageviews as well as help user to navigate the site deeply. 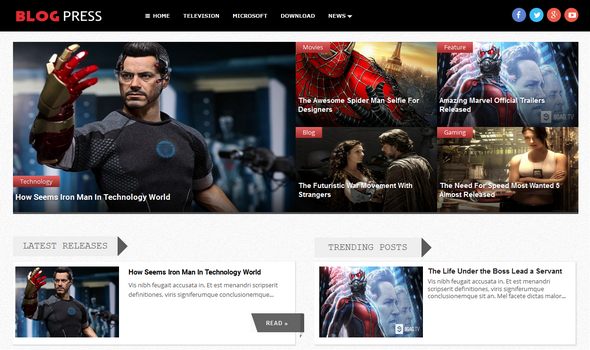 So for all these splendid features we added a cute responsive widget below every posts to display all related posts. We are really hopping that Blog Press Blogger Template would fulfill all your dreams you ever want with blogspot platform. we have tried our best to make this template unique and perfect from all other template. If we really miss anything precious then kindly let us share in below comments.